Last Monday I said a yummy mango recipe was headed your way today. Have you been unable to sleep since then? Been like a kid counting down the days til Christmas? Okay, so maybe “waiting with bated breath” is an exaggeration, but I do write today with the recipe! It’s is a little on the fancy side but not terribly challenging to prepare. I’d say it has an elegant simplicity that is worthy of a special occasion. 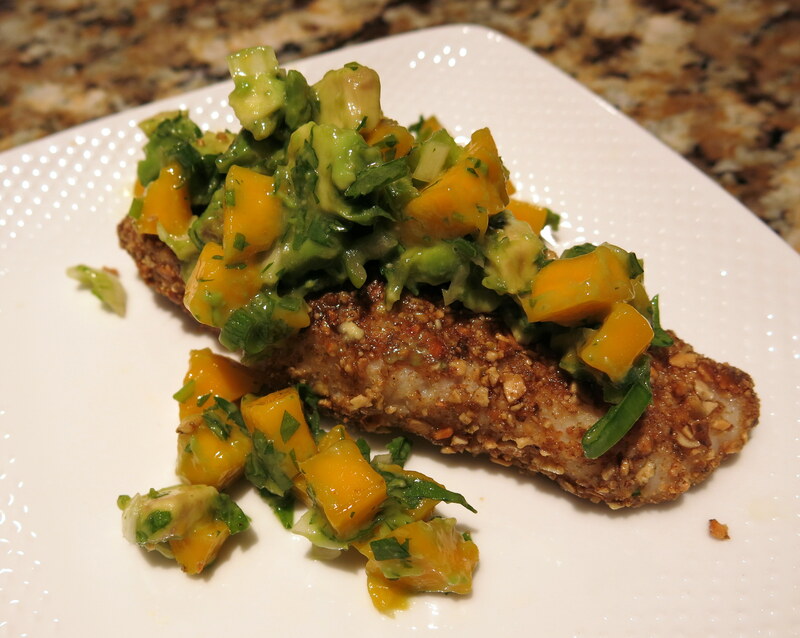 Even the name sounds a little fancy: Pepita-crusted Turbot with Avocado Mango Salsa Another Nutritious Meal (and what the heck is a pepita anyway?) If you think you’re unfamiliar with pepitas, you’re probably wrong. It’s just a fancy (or Mexican) way of saying “pumpkin seeds.” Pepitas have a lot to offer nutritionally. One-quarter cup provides 3 grams of fiber (12% DV), 2.7 mg of iron (15% DV), and 9 grams of protein. If you’re watching your saturated fat intake, keep in mind that pepitas do have a relatively high amount of this. A serving contains 20% of your saturated fat intake for the day (4 grams), twice as much as peanuts. But pepitas are also loaded with omega-3 fatty acids, which peanuts lack. Among other things, omega-3 fatty acids reduce triglycerides, decrease blood pressure, and lower your risk of heart disease. Omega-3’s are actually a theme in this recipe. Not only do the pepitas have them, but so does the avocado, along with vitamins A, C, B6, and E; folate; potassium; and magnesium. Turbot is a mild white fish. It packs a protein punch while being relatively low in fat and calories. Each six-ounce serving in this recipe has 162 calories, 27 grams of protein, and five grams of fat, very little of which is saturated. Taken together, this dish provides an excellent balance of micronutrients and explodes with essential vitamins. It was quick and easy to prepare. I really liked it, and I hope you do too! Remove turbot from refrigerator 30 minutes before cooking. Preheat oven to 400 degrees. Gently combine salsa ingredients (mango through “dash of salt”) in a medium-sized bowl and set aside. Combine petitas, cumin, and remaining 1/2 teaspoon of salt in a wide, shallow bowl. Pat turbot fillets dry with a paper towel. Brush the olive oil on both sides of the fillets, using a pastry brush. Gently roll the fillets in the pepita crust to coat. Transfer the fillets to a shallow baking pan, lined with parchment paper or aluminum foil. Bake for 10 minutes, turning halfway through, until the turbot flakes easily with a fork. Top the fillets with the salsa. I love making excuses to throw pictures of Siyona into the blog. What can I say? I’m her mom. Here’s a pic from back in the day. 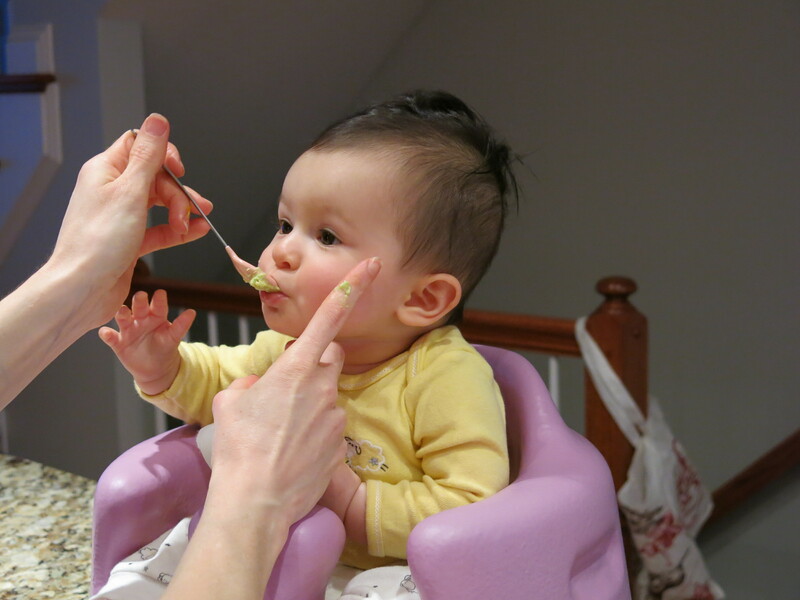 Avocado was her first food, and she’s taking one of her first bites!